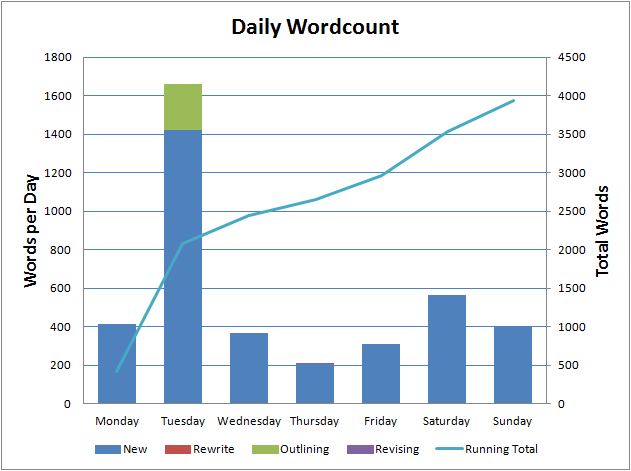 As expected, not a very productive week, writing wise, although at 3,923 words it’s not my least productive week and I hit day 70 in my writing streak. Apart from the one productive day on Tuesday, I’ve been limited to scraping together half an hour here and there to pound out a few paragraphs. What I have found is that limited time helps me focus and my words per hour rate is generally pretty good. I know I don’t have a lot of time so I don’t let myself get distracted. I worked on four stories this week, the final revisions of The Bone Boy, finishing off the first draft of In the Shadow of Memories, outlining and writing a new flash piece tentatively called The Ride and working on my monster story, Saviour. The Ride is out for feedback, Saviour still has a way to go and I’ve realised I need to rework a chunk of Memories. I also started doing some research for my next big project. It’s going to be busy week and I won’t be taking any time off so I’m expecting another low word count week but we’ll see how it goes.